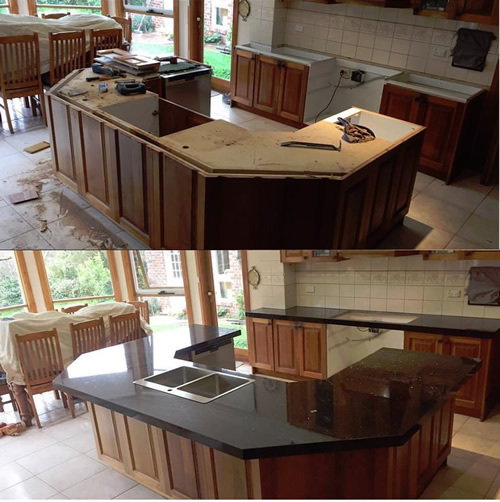 Granite benchtops are undoubtedly one of the most popular choice of stone type used in benchtop applications today. It is a light-coloured, plutonic rock commonly found in mountainous areas and offers a natural surface to go about your daily business in the kitchen. Granite countertops will end up costing more than other alternatives but there are heaps of benefits to choosing granite in your kitchen. Because of their natural durability sealed granite benchtops are both stain and household chemical resistant meaning an accident in the kitchen won’t cost you! Granite benchtops are also highly scratch and abrasion resistant so you can do your meal prep right on the main surface. Scratch marks from daily kitchen use can only be seen under high lighting unlike other materials and because granite is a natural material hot plates and pans can be put directly on their surface. Coming in a range of naturally beautiful stone designs a granite countertop can make you feel like you’ve stepped into the kitchen of your dreams. View our granite benchtop project gallery for inspiration. If you’re thinking of upgrading and bringing a new sense of life to your kitchen give the team at Just Benchtops a call and we can provide you with a new granite benchtop designed to fit the unique dimensions of your kitchen.